CRAG (Crowborough and Rotherfield Art Group). 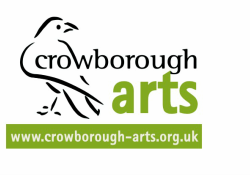 The oldest art group in Crowborough, founded over sixty years ago. Annual open studios with around forty participating artists. Community and arts centre offering workshop and exhibition space. Long established choir performing two ‘classical’ concerts a year, and a more light-hearted summer concert. Learning co-operative of older people. Bespoke picture framers and retailers of original artworks. Performing two major concerts each year, in early May and mid November with a programme of major choral and orchestral works. Offers some arts and crafts workshops. An amateur dramatic group providing a varied programme of productions. Supplies and support for visual artists. A friendly ladies choir based in Crowborough, UK. Supports activities across the arts, museums and libraries. Arts and Crafts makers based in Brighton. Community theatre group putting on a number of productions each year. It incorporates a Youth and Drama Club. presents first class chamber music concerts, performed by established artists. A long established art group open to new members. Ashdown Gallery Forest Row. Independent contemporary Art Gallery.